Just a year or so ago, here's what our living room looked like. 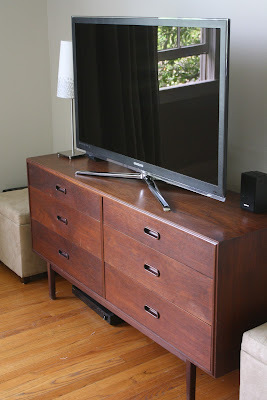 I'm sure you'll agree it was time to replace the dorm-room-esque corner TV stand of the hubby's. 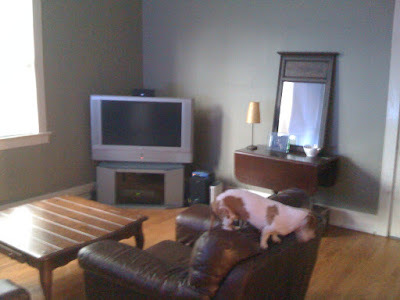 BEFORE - Wall with the television... and Bonnie. After considering all the options, I decided to look for a mid-century dresser, instead of an entertainment unit or tv stand. Ya see, the tv dictates about 50% of our "living room" time, but I tried my best to think of how I would decorate it if it wasn't dictating the space. Lots of ideas came to mind, then I windled them all down to the question "since we do have a tv what makes sense?". A dresser seemed to be the best compromise between design, storage and technology. And then I found a spectacular piece on the house of Craig. It was great... wonderfully made, great lines, but just transitional enough to last through a number of years. And six drawers! Much more than the average TV stand. But it was $1,200. While I appreciated the beauty and functionality I didn't want to spend all that jazz (I make up substitute words, by the way, so in case you aren't following jazz = dollahs) on one dresser. I kept watching Craigslist for several weeks... maybe months. It was posted again at $1,000 and I was still obsessed, but unwilling to make the plunge. Then one fateful evening, after reading some random article about the fear of commitment and getting myself pumped, I made a phone call to see if the price was negotiable. We went to see it. It looked good. And apparently the lady selling it had an antique store in NYC before moving to Greater-Birmingham. (She had LOTS of other stuff) and had purchased it for around $3,000 in New York years ago. My hubby's a great negotiator when charged, and we came in at less than half of the original $1,200 asking price. AFTER / In progress - Living room wall. 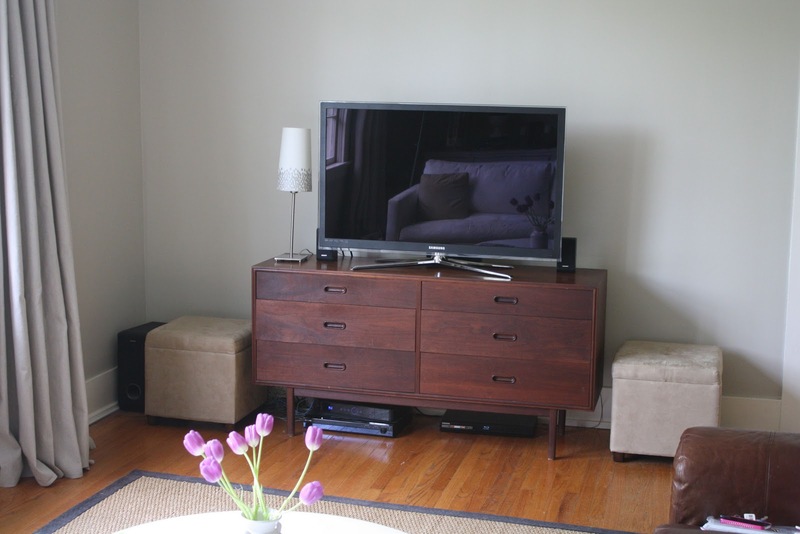 Danish modern dresser for television. I'd love to hear what you think. Experience with hard-balling your craigslist finds, working around electronics like the TV? LOVE it! And I think the stripes idea is wonderful!! !